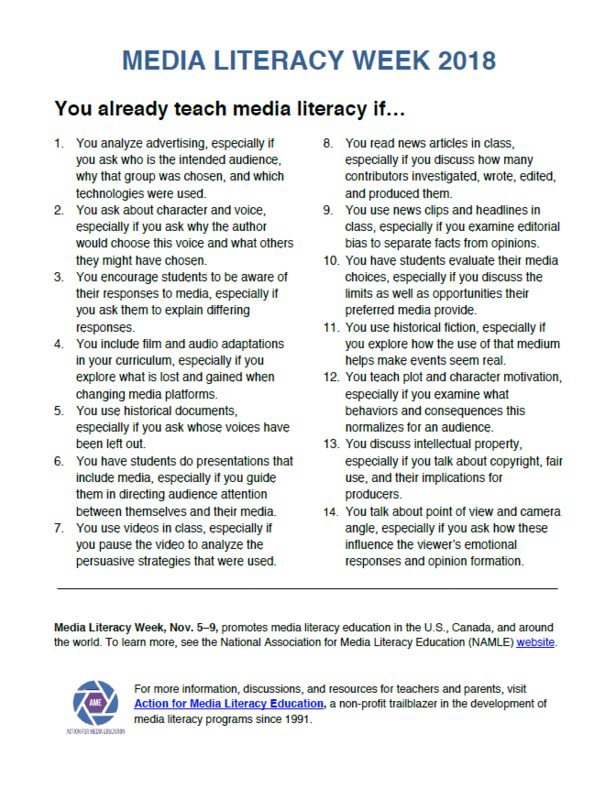 Media Literacy Week is designed to bring attention and visibility to media literacy education in the United States. Inspired by Canada’s Media Literacy Week now in its 13th year, the National Association for Media Literacy Education leads the efforts to coordinate a media literacy week in the United States to showcase the work of amazing media literacy educators and organizations around the country. The mission of Media Literacy Week is to highlight the power of media literacy education and its essential role in education today. Whether you are an individual teacher, an employee at an organization, or a researcher, you can get involved with Media Literacy Week. Between November 5 and 9, plan your own Media Literacy Event for your community. It’s up to you to decide what you want to organize, but if you need help planning, feel free to reach out to medialiteracyweek@namle.net. Share your plans with NAMLE and we will post your event on the Media Literacy Week website. Send us your logo and we will add you to the list of partners. We hope you will be a part of the 4th Annual Media Literacy Week in the United States. Amazon announced Friday, June 16 that it’s buying Whole Foods for just under $14 billion, the retailer’s largest acquisition ever. The purchase holds implications for the future of groceries, the entire food industry, and—as hyperbolic as this might sound—the future of shopping for just about anything. But let’s not get ahead of ourselves. At the simplest level, the deal represents a straightforward confluence of interests. Amazon needs food and urban real estate, and Whole Foods needs help. The e-commerce giant has been expanding into groceries and physical locations, including bookstores, ironically working itself back into the brick-and-mortar business that it’s also disrupting. Whole Foods, meanwhile, offers the biggest name in yuppie groceries and a fleet of urban locations, which can double as Amazon warehouses. Meanwhile, the grocer is in a tailspin, its stock price cascading as revenue growth has fallen every year since 2012. Investors had for weeks been pushing the company to sell itself to a larger grocer, like Kroger. That Whole Foods ended up with Amazon is poetic justice, considering that, in 2015, CEO John Mackey said Amazon’s move into grocery delivery would be “Amazon’s Waterloo.” Doubters of Amazon’s strategy can point to the fact that groceries are a terrible, low-margin business. That’s true—almost as terrible and low-margin as e-commerce, where Amazon has already demonstrated that it can hypnotize Wall Street’s myopic financiers, while it spends tens of billions of dollars building a global warehousing and delivery infrastructure for a shopping future that is moving online. In short, Whole Foods was in a free fall, and Amazon is the perfect net to catch it. Image courtesy of The Atlantic. Winners of the 2017 Pulitzer Prizes were announced Monday. The annual prizes, which mark the best in journalism from the year, have evolved over time to include digital and magazine journalism. Are you planning on attending NFFTY this year? This is your last chance to purchase Early Bird tickets for NFFTY 2017. Ticket prices will go up on March 25, so don’t delay! NFFTY is the largest film festival for emerging filmmakers, with this year’s festival featuring 257 films from 27 countries. Join us for four days of films, our first ever 360° gallery, parties, panel discussions and more! The NFFTY 2017 festival will be held April 27 to 30 in Seattle, WA. For schedule and ticket information, visit www.NFFTY.org. Click here to buy tickets for NFFTY 2017 now. 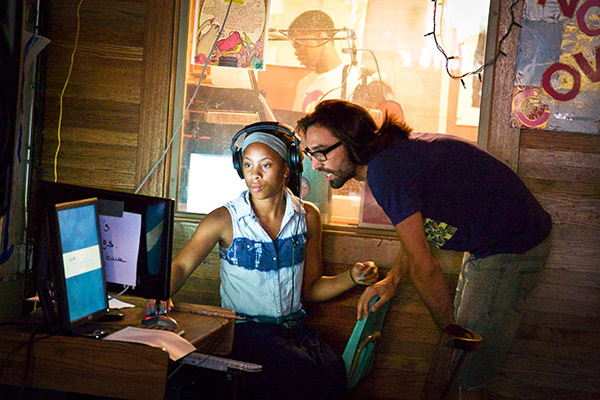 Reel Grrls empowers young women and gender non-confirming youth from diverse communities to realize their power, talent and influence through media production. The organization has awesome spring events coming up, including a Finances of Film Panel and Workshop, Snap Webisode, and more summer activities. View the most recent newsletter about current programs here. Image courtesy of Reel Grrls. 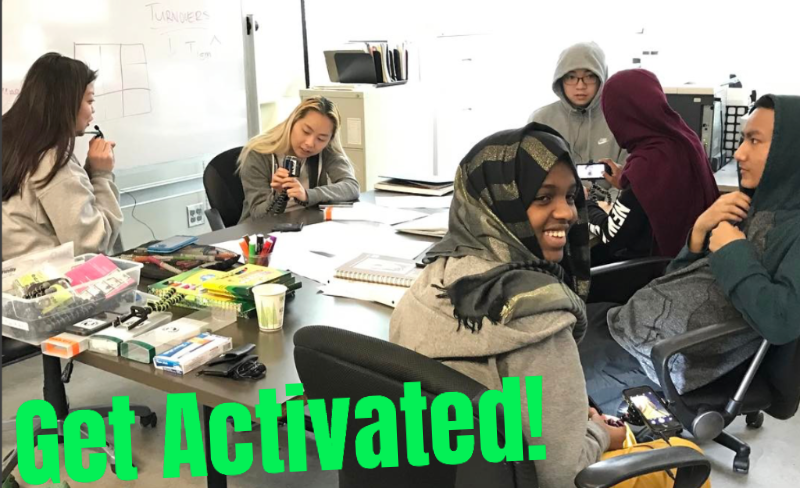 The Paul G. Allen Family Foundation and Seattle Public Schools (SPS), in partnership with the City of Seattle, will open up new career and college pathways for city youth to graduate from high school “Seattle Ready,” by establishing new media arts courses in the Seattle Public Schools Skills Center. Skills Center courses, taught by industry professionals, will enable students to be competitive in the local workforce and provide the opportunity to live and work in Seattle. Image courtesy of the City of Seattle Office of Arts and Culture. Join Common Sense Education for the next Digital Learning and Leadership webinar! The Northwest Alliance for Responsible Media, NWARM, is a media literacy group in the Spokane, WA area. On Wednesday, March 22, 2017 from 8:45 a.m. to 2 p.m. NWARM is holding their third annual MediaFest, held at KSPS Public Television Station. The one-day event brings together 80-100 area high school students interested in media careers with working professionals from every aspect of Spokane’s media to learn about potential careers and encourage critical thinking about media in students’ lives. For more information about MediaFest 2017, visit the KSPS website here. To learn more about NWARM, visit their website here, or follow them on Facebook. From trolls and bullies to scammers, the internet can be a scary place full of risks for students who go online almost daily. In fact, one of every four teens has experienced bullying while online, the Cyberbullying Research Center reports. Microsoft has heeded that call this year by releasing its first Digital Civility Index, compiled from surveys of teens and adults in 14 countries. The research indicates that 65 percent of adults and teens have experienced some form of safety risk while online; the most frequently cited safety risk was unwanted contact, with cyberbullying and trolling coming in second. Read more at Ed Tech Magazine. Image courtesy of Ed Tech Magazine. On Tuesday, December 6, the National Film Festival for Talented Youth (NFFTY) is hosting its first annual fundraiser. It will be a night of films, free wine and food, and some cool raffles to bid on. Tickets are only $30 each and will help to benefit NFFTY. They can be purchased here. During these turbulent times, NFFTY provides a perfect space for the expression of young artists. NFFTY depends on the generous donations of its supporters. If you cannot attend but would like to make a donation, you can always do that at the NFFTY website. Our celebration was a success! With over 60 people in attendance, from educators to policy makers and all types of professionals in between, our 25th anniversary celebration was a success! Thank you for joining us on our journey in the last 25 years. We look forward to many more years of your support, encouragement and interest in changing the world of digital citizenship and media literacy. Media Literacy Week, October 31 – November 4, will kick off on Friday, October 28, 2016, when Twitter will host the Digital Citizenship Summit launch event for U.S. Media Literacy Week at their San Francisco headquarters. The all-day global event aims to work towards solutions, promote best practices, and empower citizens to “be the digital change.” The event is being livestreamed (or Periscoped) through Twitter’s @Safety account, and can also be watched directly at BeTheDigitalChange.com. The Summit features a diverse range of speakers and panels, working towards the one underlying question: How can we be the digital change? Participants can also follow along and contribute by using #digcitsummit, #BeTheDigitalChange, and #MediaLitWk. The mission of Media Literacy Week is to highlight the power of media literacy education and its essential role in education today. 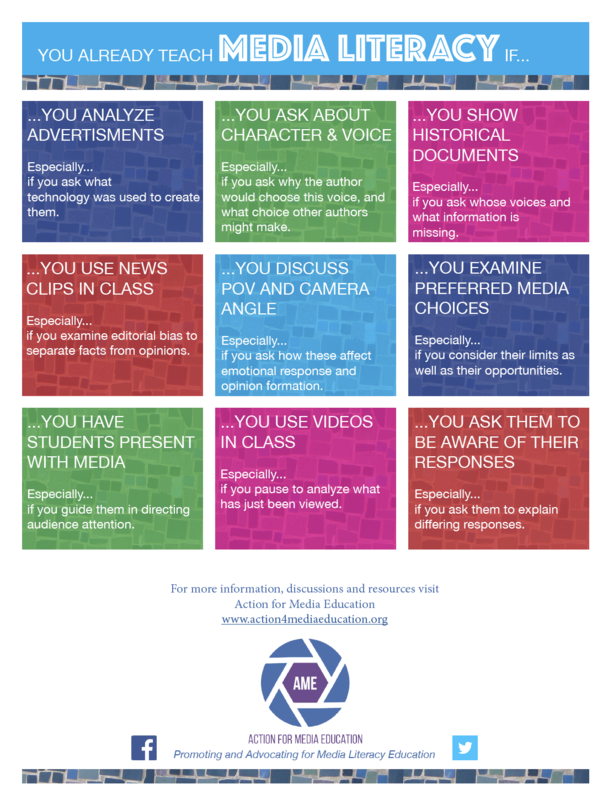 Media Literacy is the ability to ACCESS, ANALYZE, EVALUATE, COMMUNICATE and CREATE using all forms of media. RSVP for our 25th anniversary celebration on Thursday, November 3 during the second annual Media Literacy Week, hosted by the National Association for Media Literacy Education (NAMLE). Be sure to mark your calendars for Media Literacy Week which will be held this year from October 31st through November 4th. The Digital Citizenship Summit hosted by Twitter as their San Francisco headquarters will serve as the launch event for this important week. The event featuring presentations, panels, videos and awards will be live-streamed so that you will be able to access the day’s activities from wherever you might be on October 31st. The National Association for Media Literacy Education (NAMLE) is leading Media Literacy Week and will be partnering with the The Digital Citizenship Summit and Twitter for this launch event. Get more information at The Digital Citizenship Summit. Action 4 Media Education would like to invite you to our 25th anniversary celebration! We will be highlighting our many programs over the years, as well the recent passage of Washington’s Digital Citizenship /Media Literacy bill. The party will be Thursday, November 3, from 5:30 – 8 p.m. at Ivar’s Salmon House. Come share food and drink while connecting with former and current AME members as well as new leaders in Media Literacy. Time: 5:30 – 8 p.m. with toast to be held at 6:30 p.m.
We have scheduled our 25th Anniversary Celebration to coincide with National Media Literacy week, October 31 – November 4, 2016. Expected guests will include media professionals, TV personalities, state senators, published authors and many more! Attendees will even be able to snag a copy of AME member Nick Pernisco’s new book Practical Media Literacy: An everyday guide for teachers, parents, and students of all ages. Join us in celebrating a pivotal moment for media, technology, education and access. For more info contact Marilyn Cohen at macohen@uw.edu. Keep up to date with the latest media literacy and AME news by subscribing to our blog!